Fenton, Terry. "Modernist Art on the Prairies". The Canadian Encyclopedia, 24 July 2015, Historica Canada. https://www.thecanadianencyclopedia.ca/en/article/modernist-art-on-the-prairies. Accessed 23 April 2019. Generally speaking, the word "modernism" refers to the advanced literature, music, and visual art of the 20th century, but for the painting and sculpture of prairie Canada, Clement GREENBERG's somewhat narrower definition is appropriate. Generally speaking, the word "modernism" refers to the advanced literature, music, and visual art of the 20th century, but for the painting and sculpture of prairie Canada, Clement GREENBERG's somewhat narrower definition is appropriate. Greenberg visited the prairies several times but, beyond this, his conception of modernism was central to international discourse and controversy about visual arts in the latter half of the 20th century. Greenberg believed modernism to be the product of an avant-garde that maintained the standards set by the great art of the past. To accomplish this it aligned itself with the conditions of its medium: to pictorial shape and flatness in painting and to assemblage, rather than modelling or carving, in sculpture. In both cases this led to abstraction. Modernism was barely present in prairie Canada before 1950. It emerged in the 1950s, stimulated by the arrival of American-trained art teachers. Notable among these were Eli BORNSTEIN, at the University of Saskatchewan in Saskatoon in 1948, and Kenneth LOCHHEAD at Regina College in 1953. Although neither were fully fledged abstract painters at the time, they were sympathetic to modernist painting and both embraced abstraction later. In 1957 Bornstein turned to what he called "Structurist Relief" inspired by Mondrian's neo-plasticism and the writings of the American artist and theorist Charles Biederman; Lochhead embraced abstraction in the 1960s. 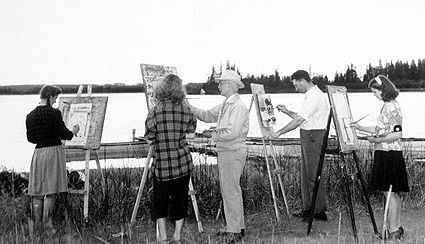 In 1955 Lochhead established the EMMA LAKE ARTISTS WORKSHOPS at the University of Saskatchewan's summer art camp in northern Saskatchewan. At the time the workshops helped focus the ambitions of young artists in Regina connected in one way or another with the School of Art and the MacKenzie Art Gallery at Regina College, but the program continued to flourish and had a vital and lasting influence on painting and sculpture in the Canadian West. Regina remained the centre of modernism in Saskatchewan until 1962, when Lochhead invited the American critic Clement Greenberg to lead an Emma Lake Workshop. He toured the prairies subsequently to write an article on "The Art of Prairie Canada" for Canadian Art. In the article, Greenberg singled out the abstract painters in Regina - especially McKay - for special praise, but noted that Saskatoon as well boasted a contingent of ambitious abstract artists: these included Bornstein, Bill PEREHUDOFF, Otto ROGERS and Henry Bonli. Throughout the 1960s artists from Saskatoon became increasingly involved with Emma Lake until administration of the workshop was taken up in the 1970s by the Department of Art at the University of Saskatchewan in that city. Curiously, modernist abstraction in Regina proved to be a relatively short-lived phenomenon. By the mid-60s Lochhead had departed for Winnipeg and Bloore for Toronto. Morton departed for Victoria in the 70s. McKay painted more and more sporadically and seemed unable to move his art forward after 1970. Godwin produced his most ambitious "Tartan" paintings in the early 70s, but by the end of the decade he had turned to landscape painting. Of the younger generation, Bruce Parsons and Kenneth Peters moved east, Parsons to abandon abstraction altogether; Simon de Jong moved to the West Coast; and Donovan Chester returned to craft ceramics in the mid 70s. Modernism in this focussed sense seems not to have sent down strong roots in Winnipeg. Although Don Reichert and Ken Lochhead produced memorable paintings in Winnipeg in the 1960s, both artists abandoned abstraction in the 1970s and Lochhead left the region to settle in Ottawa. In Calgary, despite pioneering work in a post-impressionist vein by Maxwell BATES, Illingworth KERR and W. L. Stevenson in the 1950s, abstraction never really caught on. Harold Feist taught briefly at the Alberta College of Art in the 1970s, but his mature works began in New York and Toronto later in the decade. Bruce O'Neil was probably the most accomplished abstract painter in Alberta in the 1970s, but painted only occasionally thereafter. By the mid 70s, the focus of modernism on the prairies had shifted to Saskatoon and Edmonton, nurtured by the Emma Lake Workshops in the former and the EDMONTON ART GALLERY in the latter. Unlike Regina, Saskatoon retained its modernists. Both Bill Perehudoff and Otto Rogers developed into major Canadian painters in the 1970s and continued to produce at a high level thereafter. In addition, a younger generation made its mark: In the 70s, Douglas BENTHAM became the first sculptor of consequence in the West to work with welded steel in the Picasso-David Smith-Anthony Caro tradition and painter Robert Christie emerged as a colourist of striking individuality. In the 1990s they were joined by the younger Jonathan Forrest, whose work ranks with the best painters of his generation. Under Christie and Otto Rogers, the Emma Lake Workshops were revitalized in the 1970s and 80s. Although the Edmonton Art Gallery exhibited a number of international artists in the 1970s, artists in that city struggled during the decade. Important tendencies were there in embryo: Douglas HAYNES had emerged from rather rigid impastoed images to a more relaxed painterly manner that was to mature in the 1980s, and the young Allan REYNOLDS led the way in sculpture with wood constructions that anticipated a flowering of assembled steel sculpture in the next decade. In 1978 Peter HIDE, a young British sculptor, arrived to teach at the University of Alberta. Trained at St. Martins in London, Hide had apprenticed with Anthony Caro. His arrival reinforced the development of assembled sculpture in Edmonton initiated by Reynolds. Since that time many sculptors - generally pupils of Hide's - have turned Edmonton into an international centre with a regional style that differed from the dominant Smith and Caro traditions (in fact, Caro - who led a workshop at Emma Lake in 1977 - came to Edmonton subsequently to work in situ). The Edmonton manner tended to be compact, massive and monolithic, in contrast to Caro's more open, linear work. Although the artists shared some common interests, the manner allowed for individuality. Practitioners included Catherine Burgess, Ken MACKLIN, Isla Burns, Vesna Makale and Clay Ellis - the latter recently exploring coloured relief in extruded plastic. Abstract painting in Edmonton also had a kind of commonality. Many of the artists were influenced in some degree by the "allover" abstraction of the 1970s, particularly the paintings of the Americans Jules Olitski and Larry Poons. They came into their own in the 1980s, at a time when Edmonton had ceased to be a boomtown and studio spaces became available in commercial properties. These included Terrence KELLER, Robert SCOTT, Graham PEACOCK, Phil Darrah, and more recently, Mitchel Smith and Sheila Luck as well as the aforementioned Douglas Haynes. Unfortunately the remoteness of Edmonton has made it difficult for many of them to achieve the national exposure that the quality of their art warrants. 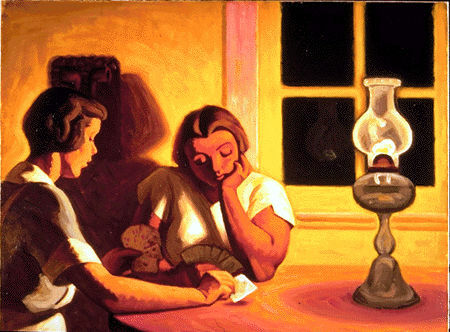 The English tradition dominated prairie painting before World War II. Many of the artists in the West during this period were born and trained in England; most painted landscapes influenced by Constable, Turner and the great British watercolour painters. After the war that tradition merged with French/American modernism to produce a vigorous hybrid. In the 1950s abstraction was "in the air." It favoured large scale, schematic organization, cubist design and the exploitation of accident and chance. Landscape painters responded to its influence even while decrying its dominance. Senior artists responded in mid-career, while many of the younger ones started in abstraction and turned to landscape later. Most were encouraged to discover new approaches to Canadian landscape by the fact that prairie subjects had been passed over by the GROUP OF SEVEN who had dominated Canadian painting before the war. The city of Calgary was the foremost art centre on the prairies in the immediate post-war years. A lively local art scene, centred upon the Alberta College of Art, was reinforced by its proximity to Banff with its mountain scenery and summer art school. Although the Group of Seven influence stemming from Banff was strong, alternatives were available in the English-derived watercolours of W. J. PHILLIPS and A. C. Leighton. The arrival of Illingworth Kerr to head the Alberta College of Art after the war at first seemed to reinforce the Group of Seven influence. Kerr had been trained at the Ontario College of Art in the late 1920s and applied the Group manner - especially Jackson's - to prairie subjects during the 1930s. However, he studied one summer in the late 1940s with the German/American painter Hans Hofmann in Provincetown, NY. Thereafter, although experimenting briefly with abstraction, Kerr found a way to marry the Group's approach with post-war modernism. Among other things he was able to paint successfully on a large scale with Fauve-influenced colour, something the Group never fully achieved. Calgary was slow to accept abstraction, but its apparent backwardness had offsetting advantages. Ambitious landscape painting continued to flourish respectably there. The city was home to Maxwell Bates and W. L. Stevenson, both of them influenced by European expressionism. While Bates was primarily a figure painter, his simpler landscapes were consistently successful. Stevenson's landscapes, which owed something to Soutine, are some of the boldest works in the genre that Canada has produced. Tragically, he died prematurely in 1965. Later, Bill Dumas painted fine Fauve-influenced landscapes, and Barbara Ballachey, Ken Christopher and Michael Matthews, partly through involvement with Emma Lake, developed bold, semi-abstract manners that owed much to 1960's abstraction and to the American, Milton Avery. In Winnipeg, George Swinton painted "expressionist" landscapes in the late 1960s and early 1970s. In the 1970s, Ivan EYRE produced large, meticulous landscapes with a surrealist, German expressionist overtone. Regina, for some reason, didn't produce modernist-oriented landscape painters in the post-war era, an exception being Ted Godwin, who turned to landscape painting in the late 1970s and continued after retiring to Calgary in the 1980s. Like his former teacher, Illingworth Kerr, he successfully wedded the Group of Seven approach to American modernism. Edmonton lacked a strong landscape tradition during and after the war, but in the 1970s Ron Myren and Brian Chubb produced strong new work influenced by Goodridge ROBERTS and W. L. Stevenson. In the 1980s, Hendrik Bres, Gerald Faulder and Hilary Prince explored more northerly subjects. Bres, in particular, found an original way to absorb contemporary abstraction in long, frieze-like paintings. John McKee, trained in the United States, found a photo-realist approach to landscape painting of parkland subjects. Saskatoon, partly because of its attachment to Emma Lake, spawned several modernist-oriented landscape painters, rivalling Calgary as a centre for the genre. Three of them, Ernest LINDNER, Reta Cowley and Wynona Mulcaster, emerged in the late 1940s. Lindner's Germanic sensibility led him to focus on forest interiors in the north, to close-up "portraits" of rotting stumps in watercolour and acrylic. Cowley absorbed the influence first of W. J. Phillips and later of John Marin to produce some of the most original watercolours of the era. 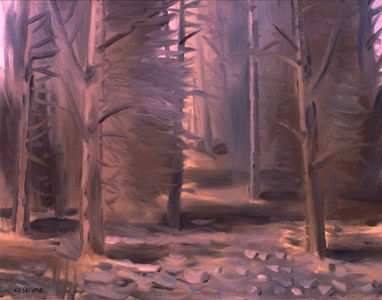 One of Cowley's students, Dorothy KNOWLES, turned from abstraction to landscape in the early 1960s following an Emma Lake Workshop and went on to become the foremost Canadian landscape painter of the era. Her thinly painted canvases exploited a web of suggestive drawing, often on a large scale, in works that absorbed influences from English watercolours and Cézanne to Jackson Pollock. Greg Hardy and David Alexander also took lessons from Emma Lake workshops to produce bold modernist landscapes, and Edward Epp - another artist who started in abstraction - found a original way to paint watercolour landscapes.